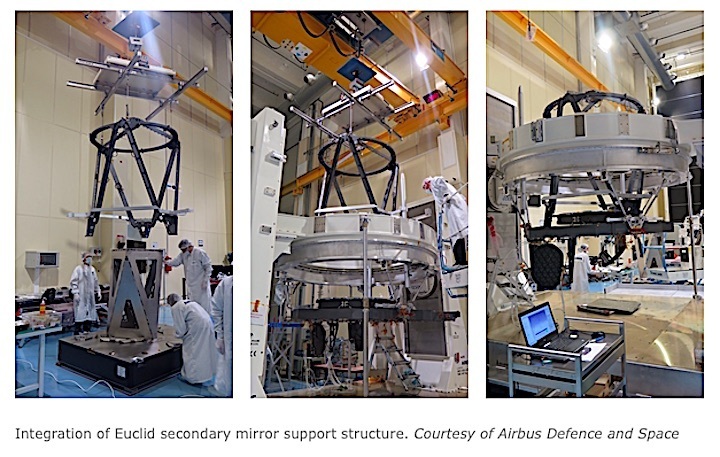 Three detector systems for the Euclid mission, led by ESA (European Space Agency), have been delivered to Europe for the spacecraft's near-infrared instrument. The detector systems are key components of NASA's contribution to this upcoming mission to study some of the biggest questions about the universe, including those related to the properties and effects of dark matter and dark energy -- two critical, but invisible phenomena that scientists think make up the vast majority of our universe. "The delivery of these detector systems is a milestone for what we hope will be an extremely exciting mission, the first space mission dedicated to going after the mysterious dark energy," said Michael Seiffert, the NASA Euclid project scientist based at NASA's Jet Propulsion Laboratory, Pasadena, California, which manages the development and implementation of the detector systems. Euclid will carry two instruments: a visible-light imager (VIS) and a near-infrared spectrometer and photometer (NISP). A special light-splitting plate on the Euclid telescope enables incoming light to be shared by both instruments, so they can carry out observations simultaneously. The spacecraft, scheduled for launch in 2020, will observe billions of faint galaxies and investigate why the universe is expanding at an accelerating pace. Astrophysicists think dark energy is responsible for this effect, and Euclid will explore this hypothesis and help constrain dark energy models. This census of distant galaxies will also reveal how galaxies are distributed in our universe, which will help astrophysicists understand how the delicate interplay of the gravity of dark matter, luminous matter and dark energy forms large-scale structures in the universe. Additionally, the location of galaxies in relation to each other tells scientists how they are clustered. Dark matter, an invisible substance accounting for over 80 percent of matter in our universe, can cause subtle distortions in the apparent shapes of galaxies. That is because its gravity bends light that travels from a distant galaxy toward an observer, which changes the appearance of the galaxy when it is viewed from a telescope. Euclid's combination of visible and infrared instruments will examine this distortion effect and allow astronomers to probe dark matter and the effects of dark energy. Detecting infrared light, which is invisible to the human eye, is especially important for studying the universe's distant galaxies. Much like the Doppler effect for sound, where a siren's pitch seems higher as it approaches and lower as it moves away, the frequency of light from an astronomical object gets shifted with motion. Light from objects that are traveling away from us appears redder, and light from those approaching us appears bluer. Because the universe is expanding, distant galaxies are moving away from us, so their light gets stretched out to longer wavelengths. Between 6 and 10 billion light-years away, galaxies are brightest in infrared light. JPL procured the NISP detector systems, which were manufactured by Teledyne Imaging Sensors of Camarillo, California. They were tested at JPL and at NASA's Goddard Space Flight Center, Greenbelt, Maryland, before being shipped to France and the NISP team. Each detector system consists of a detector, a cable and a "readout electronics chip" that converts infrared light to data signals read by an onboard computer and transmitted to Earth for analysis. Sixteen detectors will fly on Euclid, each composed of 2040 by 2040 pixels. They will cover a field of view slightly larger than twice the area covered by a full moon. The detectors are made of a mercury-cadmium-telluride mixture and are designed to operate at extremely cold temperatures. "The U.S. Euclid team has overcome many technical hurdles along the way, and we are delivering superb detectors that will enable the collection of unprecedented data during the mission," said Ulf Israelsson, the NASA Euclid project manager, based at JPL. Delivery to ESA of the next set of detectors for NISP is planned in early June. The Centre de Physique de Particules de Marseille, France, will provide further characterization of the detector systems. 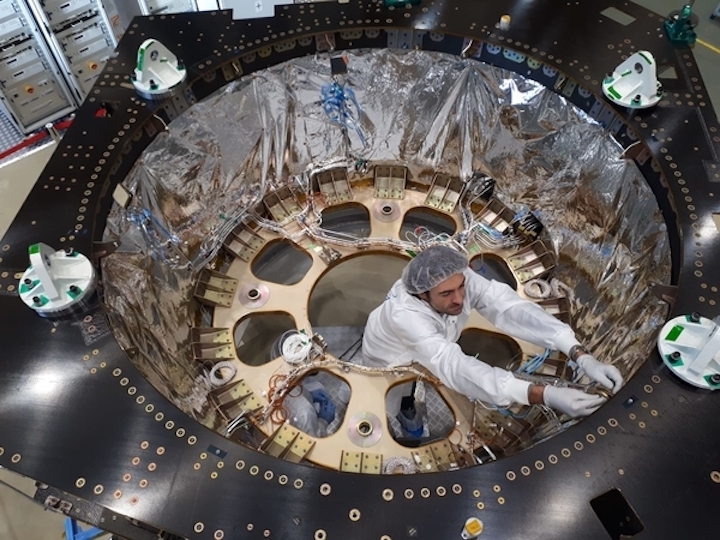 The final detector focal plane will then be assembled at the Laboratoire d'Astrophysique de Marseille, and integrated with the rest of NISP for instrument tests. WASHINGTON — Problems with infrared detectors provided by NASA will delay the delivery of an instrument for a European Space Agency astronomy mission by a year or more, a NASA official said Oct. 18. 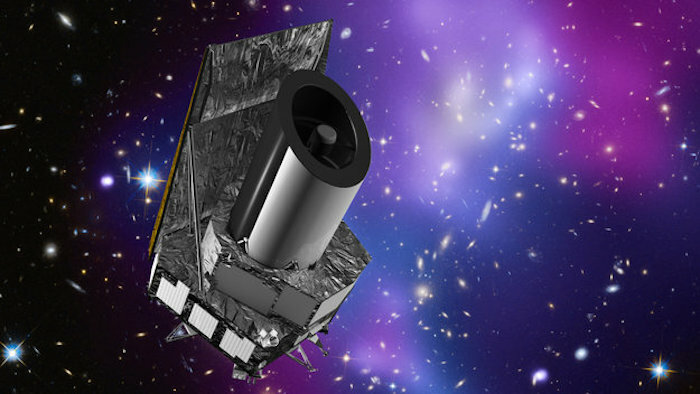 Paul Hertz, director of NASA’s astrophysics division, said engineers found problems during recent testing of infrared detectors being provided by NASA for ESA’s Euclid space telescope, which had been planned for launch in 2020 on a Soyuz rocket from French Guiana. “The detector systems that we had been developing for delivery for ESA has been failing in their characterization testing before delivery,” he said at a meeting of the Astrophysics Advisory Committee. The problem, he said, is with an electronics package that malfunctions at the cold temperatures it will operate at on the mission. That problem did not appear in earlier qualification tests of the system. “We are having to go back and redesign the electronics package,” followed by requalification of the unit, he said. Work on other elements of the instrument package are unaffected, he added, but overall integration will have to wait until the electronics are requalified. That will delay the completion of the instrument. “This is going to cause a delay of at least 12 months, which will have impacts on the ESA mission,” he said. The instruments, he said, are on the critical path for the overall development of the spacecraft, although he did not indicate the length of the delay for Euclid itself. NASA spokesperson Felicia Chou said Oct. 19 that NASA is looking into two possible solutions to the technical issues found during testing, both which involve redesigns that may take 12 to 18 months. “NASA will convene a review of both options in December 2017 by an independent panel,” she said. NASA agreed in 2013, as its contribution to Euclid, to provide components for the near-infrared instrument and establish a science center to support the mission. The agency spent $22.3 million on the mission in fiscal year 2016, the last year spending figures were available, and requested $6.9 million in 2018, stating that the decrease was linked to the completion of hardware. ESA’s decision to involve NASA in the instrument, known as the Near-Infrared Spectrometer and Photometer (NISP), was based on the lack of similar detector technology in Europe. “The NISP detectors were procured in the USA because such advanced devices were not available in Europe at the time,” ESA noted in an April 2017 press release about the delivery of detectors for the instrument. ESA's Euclid mission has passed its critical design review, marking the successful completion of a major phase in the progress of the project. The review verified that the overall mission architecture and detailed design of all its elements is complete, ensuring that it will be able to perform the unprecedented galaxy survey needed to tackle the mysteries of the dark Universe, and clearing the way to start assembling the whole spacecraft. The critical design review (CDR) board meeting took place on 21 November in Noordwijk, the Netherlands. While the individual elements of Euclid – the spacecraft, scientific instruments, launcher, and the operational and science ground segments – had already passed their independent CDRs, the mission-level review focussed on the ensemble of all these elements and ascertained their capability to function together to accomplish the mission's goals. The review verified that the most realistic predictions of the combined performances are compliant with the mission requirements. 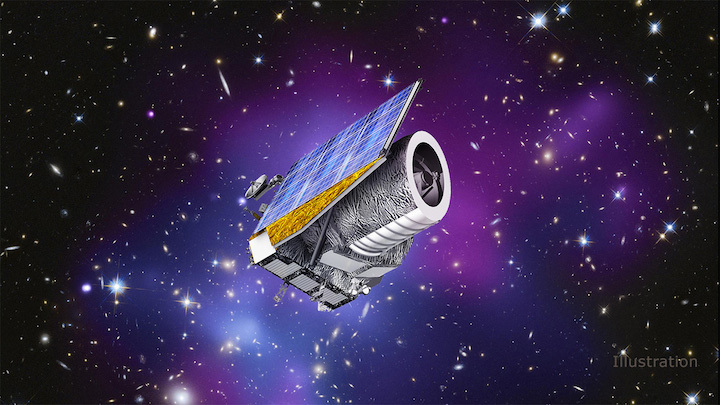 The review also assessed the feasibility of Euclid's survey with the designed flight hardware, which will image billions of galaxies across the cosmos at unprecedented sharpness and sensitivity during a nominal mission period of six years. With the completion of this milestone that validated the whole project – from the spacecraft development to launch and operations, including also the observational methods and data analysis strategy – the assembly, integration and testing of the spacecraft flight model can begin. Immediately after launch, scheduled for June 2022, the ground segment will be ready to take over and start the operations to perform the groundbreaking sky survey. 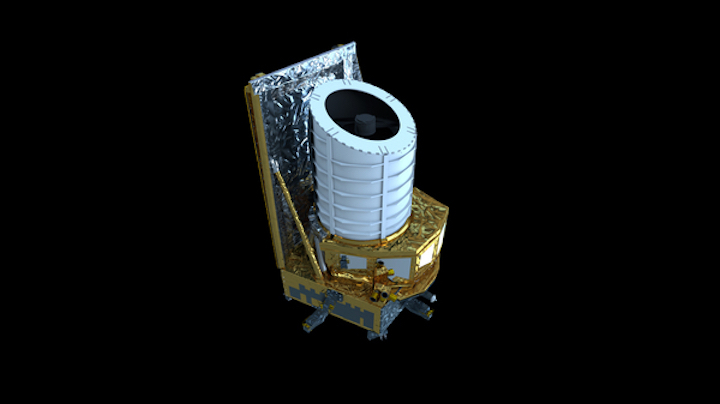 Euclid is a medium-class mission in ESA's Cosmic Vision programme to investigate the expansion of our Universe over the past ten billion years, probing cosmic epochs from before the expansion started to accelerate, all the way to the present. To this aim, Euclid will survey galaxies at a variety of distances from Earth, over an area of the sky covering more than 35 percent of the celestial sphere. By making use of both weak gravitational lensing, which measures the distortion of distant galaxies caused by intervening matter, and baryonic acoustic oscillations, based on measurements of the clustering of galaxies, the mission will capture a 3D picture of the evolving distribution of both dark and ordinary (or baryonic) matter in the cosmos. This will enable scientists to reconstruct the past few billion years of the Universe's expansion history, estimating the acceleration caused by the mysterious dark energy to per-cent-level accuracy, and possible variations in the acceleration to 10 percent accuracy. The spacecraft consists of a service module – comprising all conventional spacecraft subsystems as well as the instruments' warm electronics units, sunshield and solar arrays – and a payload module. On the payload module, Euclid's telescope – a 1.2 m-diameter three-mirror 'anastigmatic Korsch' configuration – will direct the cosmic light to two instruments: the wide-field visible imager (VIS) and the near-infrared spectrometer and photometer (NISP).